Leading UK disability charity Scope has recently revealed some worrying statistics which suggest that too many disabled individuals are encountering establishments that refuse to meet the required standards for wheelchair access. A full 76% of the surveyed individuals commented that they had previous experience of public facilities neglecting wheelchair users, and 18% of wheelchair users also encountered difficulties when visiting a restaurant during 2013. More than 12 million disabled people live in the UK, and their combined spending is worth a staggering £80 billion on an annual basis. With that fact in mind, it is startling to realise just how many of these individuals are still majorly inconvenienced by a lack of public provision. Last year, 21% of disabled people found themselves unable to attend a cinema, theatre or concert as a direct result of their condition being overlooked by such public facilities; and such figures are simply not acceptable. It is a legal obligation to undertake ‘reasonable changes’ to ensure that a disabled person can access a public area. Failure to comply with this legislation can lead to businesses facing legal action should a disabled person feel unfairly treated; and at the very least a substantial loss of reputation is at risk. It is a sad fact that a few premises simply cannot be readily reconfigured to incorporate disabled access routes, yet it is also true that many facilities could, and should, take these steps and do not. 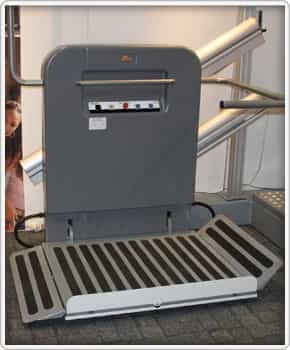 Here at Axess 2 we believe that it is important to ensure that your building is in full compliance with the Disability Discrimination Act and Part M of the Building Regulations, so one of our specialities is providing an unparalleled selection of disabled lifts. These solutions see widespread use in both public and home environments, and are proven to be successful when it comes to ensuring ease of wheelchair and similar disabled access. Our lifts are available in a range of different styles, so they can be incorporated into the widest possible scope of buildings. As a family owned company, we are very proud to be able to offer the widest assortment of platform lifts in the whole of Europe, and we take our high standards of customer service incredibly seriously. A mobility concern is not a matter to be taken lightly, so why not ensure that your building is as well prepared as possible for such an eventuality by investing in one of our lifts? Call us on 01200 405 005 to find out more.